The Pelagian brings divers to some of the most fertile underwater landscape on the planet. 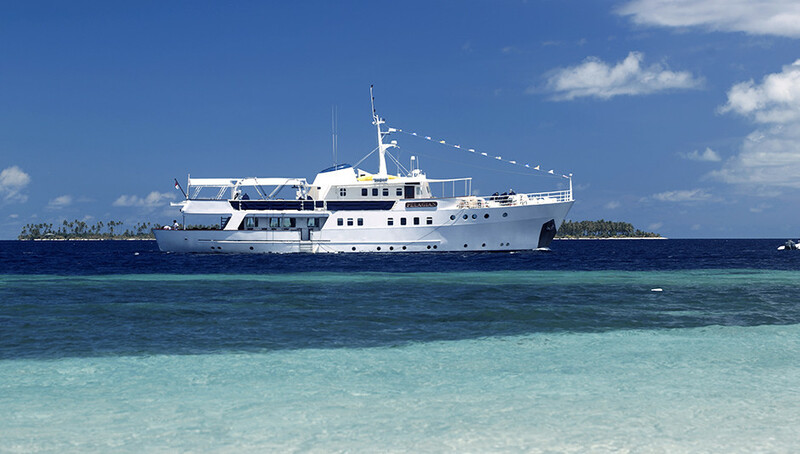 From its base at Wakatobi Dive Resort, our 35-meter luxury dive yacht embarks on cruises along the outer reefs and atolls of the Wakatobi Archipelago, and to the southern coast of Buton Island. This itinerary encompasses sites ranging from exciting drifts over towering pinnacles and steep walls to leisurely critter hunts on shallow coral gardens and sandy slopes rich in invertebrate life. Guests often offer praise for the high levels of service the crew provides, and the comforts the accommodations allow. From the spacious cabins and fine cuisines to the personal attention of the dive guides, there’s certainly a lot to like. But even the best can sometimes be made better, and there are a few small things guests can do to ensure their time aboard the Pelagian is as good as it can get. Following are some of the tidbits of advice the crew and some former guests have to offer to make a Pelagian cruise the best ever. The Pelagian crew’s dedication to providing the ultimate in guest service extends to all aspects of the cruise. Special requests are welcomed, whether it’s help in hunting for a particularly elusive reef creature, or meeting a special dietary requirement or culinary request. “Many guests request fresh tuna for sashimi and our crew makes a special trip to Pasar Wajo market at Buton to get the tuna,”said former cruise director Ben Robinson. The stewards also often make the guest’s favorite desserts or afternoon snacks. “Our chefs are always happy to oblige in creating meals and snacks around any particular dietary need or requests. Some of our guests have requested cooking classes onboard, so our chef makes it happen,” Ben says. When it comes to locating small creatures among the intricacies of a coral reef or a rubble garden, the more eyes, the better. This is where Pelagian’s dive guides can become an invaluable resource, as they are highly experienced at locating small and hidden things. “The dive guides on Pelagian are the best we have ever had at finding fish and other creatures,” says guest Richard Gamble. But don’t just rely on the guides, and learn from them. Take note of the places they focus their attention when searching for a particular animal, and may enhance your own critter sleuthing skills. Muck diving is all about moving slowly and looking closely to discover hidden sea life. Pelagian visits a number of top-notch sites such as Asphalt Pier and Cheeky Beach, where divers can hover over seagrass and rubble terrain in search of unique finds. This type of close-quarter maneuvering can be challenging for even experienced divers, but it becomes easier when you borrow a little trick that underwater macro photographers have used for years. Rather than attempting to use fins and body language to hold position above a tiny and fragile subject, they will deploy what is known as a muck stick into an appropriate piece of bottom, and use it as an anchor point to control their distance from the sea floor. Pelagian’s dive guides might have an extra stick to lend, but just in case they don’t, they recommend you considering adding one to your dive kit.